Are you looking for something a little different than the usual “red” salsa for your Cinco de Mayo celebration? If so, this recipe is easy, delicious and is striking to look at. Go ahead and adjust the recipe to your own taste. Maybe you like hotter peppers, fewer peppers, different peppers, more cilantro, etc. The recipe is pretty easy to make to your liking. Heat a large pot or very large skillet to medium heat. Once hot, coat the bottom of the pan with olive oil. 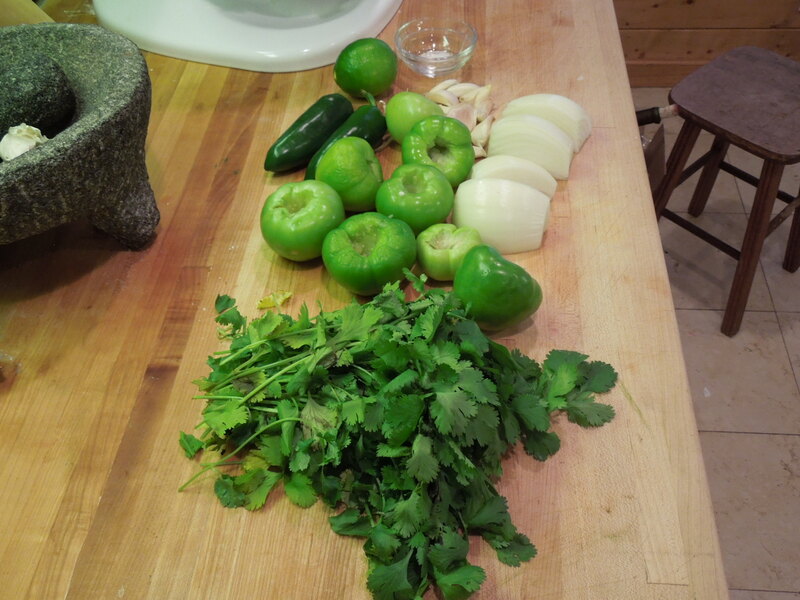 Put the tomatillos, onion, garlic cloves and jalapenos in the pot and roast the ingredients, turning occasionally, until there is charring on everything. Careful (it splatters). Remove the pot from heat and let cool until ingredients can be handled. Destem and deseed the jalapenos and pop the garlic out of their skins. Put all ingredients, including any oil left over from the pan in a blender or food processor. Add the cilantro, salt, coriander and cumin. Process into a nice, smooth consistency. Tomatillos, while frequently used in a similar fashion to tomatoes are actually in the nightshade family and are a close relative to gooseberries. Tomatillos are pretty easy to grow, however, they aren’t self-pollinators so if you want to grow some in your garden, make sure you have more than just one or two plants. Sit in a quiet place with your feet on the floor (or legs crossed in lotus position, if you prefer). Comfortably rest your hands in your lap, palm side up. Close your eyes and concentrate on your breathing. Deep breaths, in and out. Your breath should not be anxious or hurried so breathe for as long as needed to quiet that anxious feeling. Once relaxed, concentrate your mind on the center of your chest. How does it feel? Tight? Open? Stressed? Anxious? Happy? Now imagine a large pool of green light just in front of your chest that spins counter-clockwise. As you inhale, the pool of light gets bigger. As you exhale, release all tension you may be feeling. Repeat for as long as you need. Once you are feeling relaxed and your heart is open, open your eyes, slowly get up and feel the joy in the everyday pleasures of life. 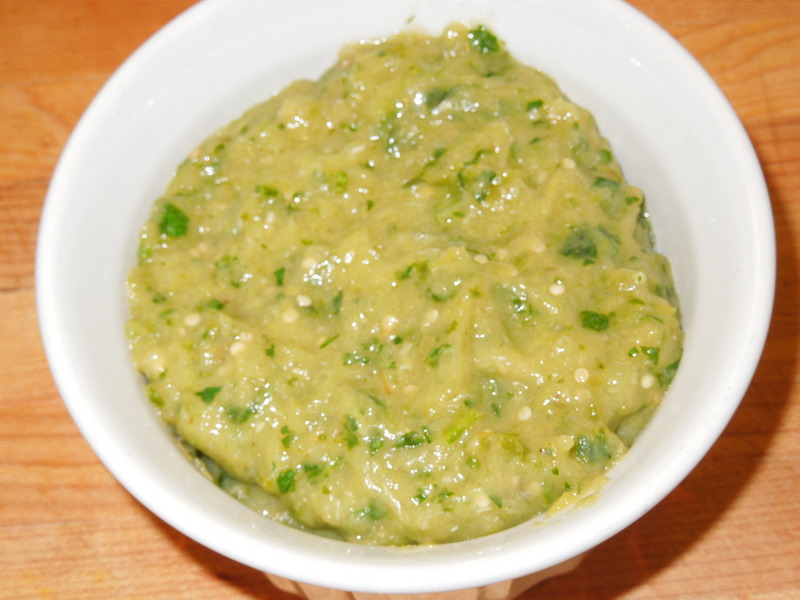 Tags: diabetically friendly recipe, food, fresh salsa recipe, gluten-free recipe, homemade salsa verde, recipes, salsa recipe, salsa verde, salsa verde from scratch, tomatillo recipe, vegan recipe, vegetarian recipe. Bookmark the permalink.